Wednesday was a rocky session for U.S. equities, as declines in tech weighed on overall sentiment. 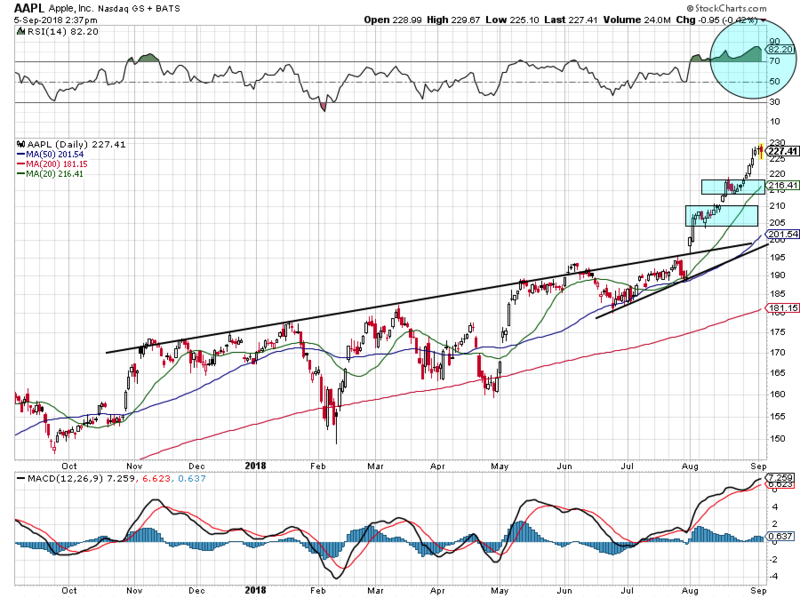 It’s unclear if this is simply a hiccup at this point, or the start of a larger correction in September. In either regard, let’s look at some of the top stock trades that played a role on Wednesday. Shares of JD.com (NASDAQ:JD) sank more than 10%, adding to its already catastrophic losses over the past few months. Recent reports over its CEO haven’t painted a very good picture. But what type of picture does the chart paint? Really bad. As shown above, on a weekly basis, JD stock has never been this oversold. Perhaps it will lead to a sharp rebound in the share price, as prior overbought conditions highlight (via blue circles). We have played support No. 1 numerous times this year, but using levels and discipline is very important. Once support No. 1 gave way, we waited to see how support No. 2 would hold up. It didn’t. Now it’s not clear where JD will go. Buying now is akin to catching a falling knife. Let’s see how and when it stabilizes, and whether it’s heading for the $22 to $23 range first. Advanced Micro Devices (NASDAQ:AMD) has been the complete opposite, rallying like mad over the past few months. If you missed the move below $10 and once again below $20, there’s no reason to chase it now just below $30. Admittedly, we took our long position off far too early in hindsight, but we still got to feast on AMD stock. 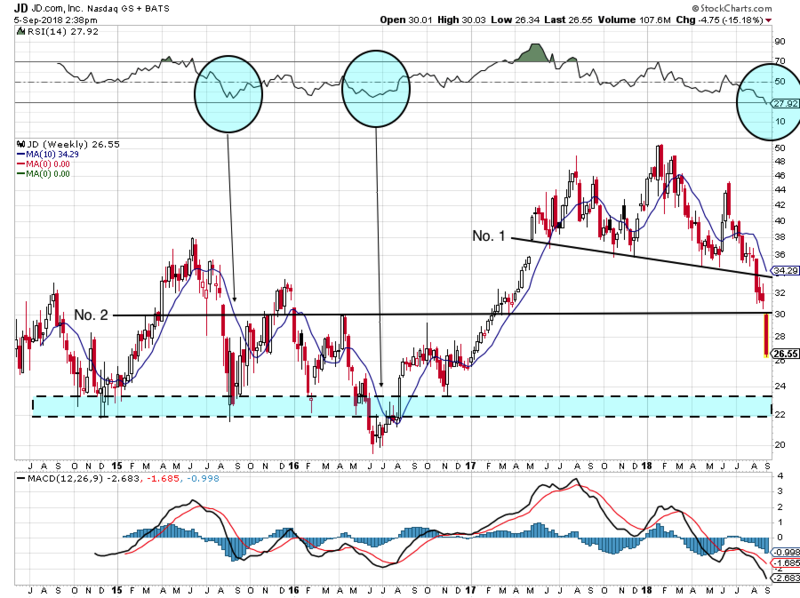 The stock has an unsustainable RSI (blue circle). 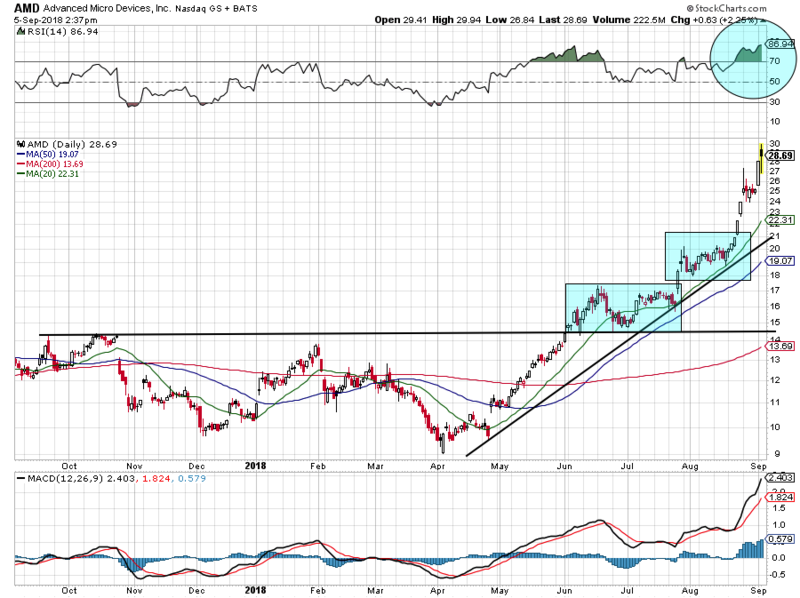 However, AMD’s current rally has had a tendency to move up, consolidate (blue rectangles) and rally again. Let’s see how it consolidates going forward. 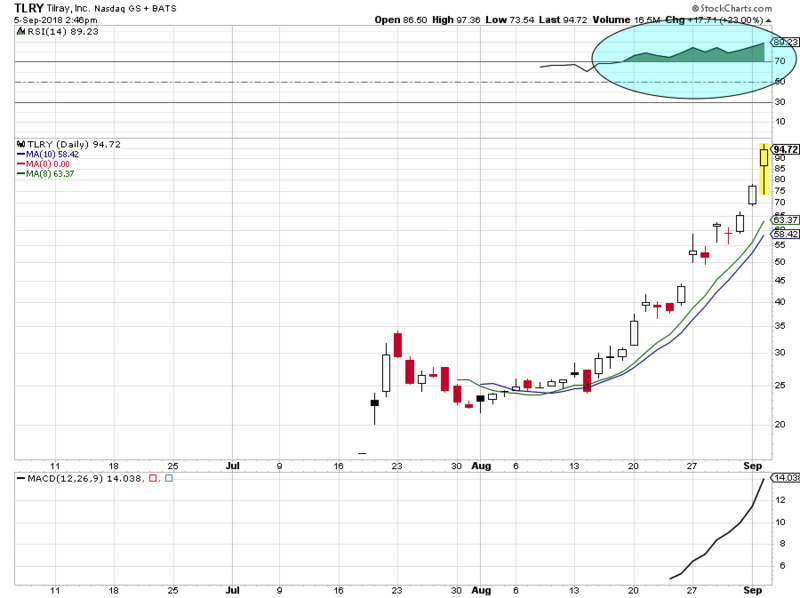 Like AMD stock, Apple (NASDAQ:AAPL) also has a high RSI. This morning, the reading stood at 86, a rather high number for a $1 trillion market cap company. The RSI isn’t our only consideration, but it is one input in the equation. Long-term investors probably won’t consider taking profits and that’s just fine. But we can probably buy this one, reasonably, on a pullback down to $220. Keep in mind its 50-day moving average is all the way down at $201. We have been a big-time bull on Apple stock, but this move has been too much, too fast. Plus, there’s no telling what it will do ahead of its iPhone event on Sept. 12. It feels like it has already rallied ahead. Maybe now it dips, or perhaps it heads higher. We don’t know yet, but we will find out soon enough. I would love a drop down toward $200 to $210. Plenty of support would come into play down there, although it’s not clear a decline of that magnitude will surface. Pot stocks are so lit! Wow, I’m sorry I couldn’t help the pun, especially because it’s true. Tilray (NASDAQ:TLRY) has gone from an opening-day low of $20 back in July to a high of $97 Wednesday, after TLRY stock’s 23% rally. The market cap is closing in on $10 billion, as the rally has been nothing short of insane. But investors will have plenty of regret if they buy in now. Expectations only call for sales of $41 million this year, and $153 million next year. While that’s incredible growth, TLRY trades at a laughable 225 times this year’s sales and almost 60 times next year’s sales. Heck, the eight-day moving average is $30 below current levels, while the RSI sits all the way up at 90. This is a classic no-touch. Let’s keep it simple with Home Depot (NYSE:HD). HD is a great company, it has great fundamentals and now, it has a great stock chart. 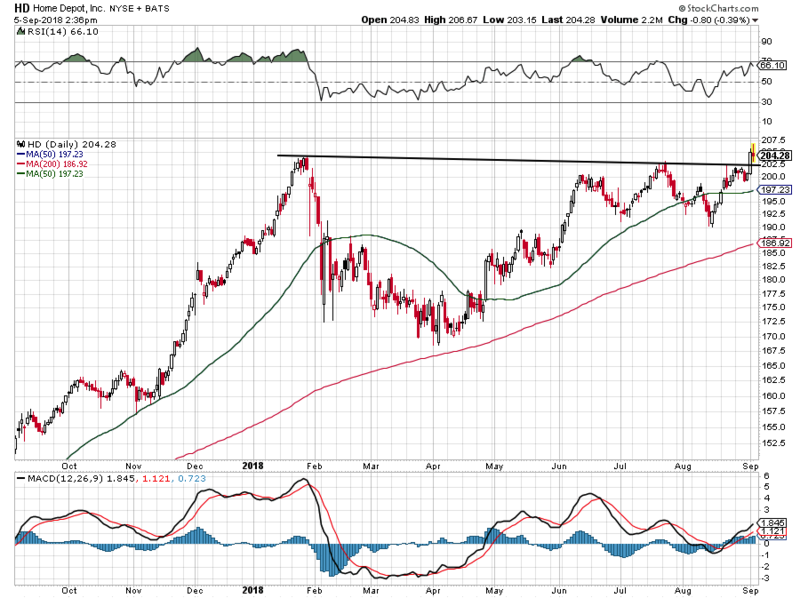 With a breakout over this $202.50 level, HD stock is a buy. Below that level, investors can chalk up their minor losses and hawk a new entry. But over that mark, and it’s a long. Bret Kenwell is the manager and author of Future Blue Chips and is on Twitter @BretKenwell. As of this writing, he did not hold a position in any of the aforementioned securities. Article printed from InvestorPlace Media, https://investorplace.com/2018/09/5-top-stock-trades-for-thursday-jd-amd-aapl-tlry-hd/.